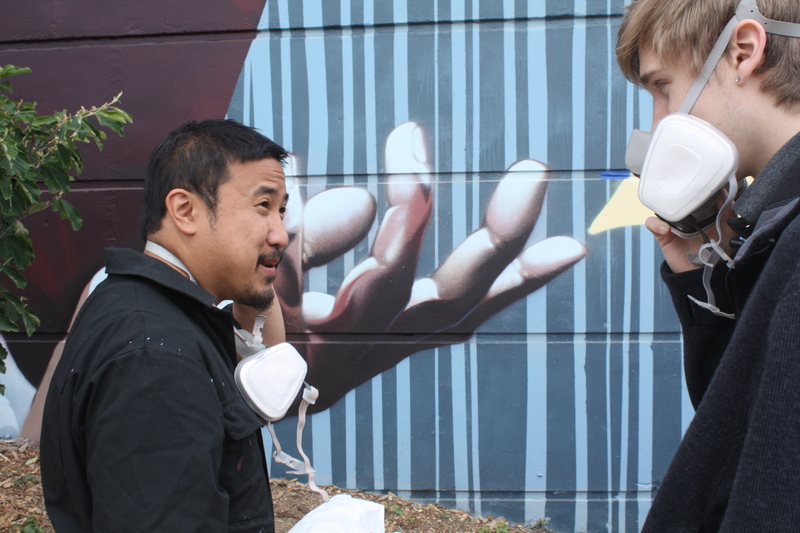 We told you earlier this month about the kids from Northwest School collaborating with artist Derek Wu on a new mural on the side of Capitol Hill Housing’s Villa Apartments above the Pillars off-leash dog area. 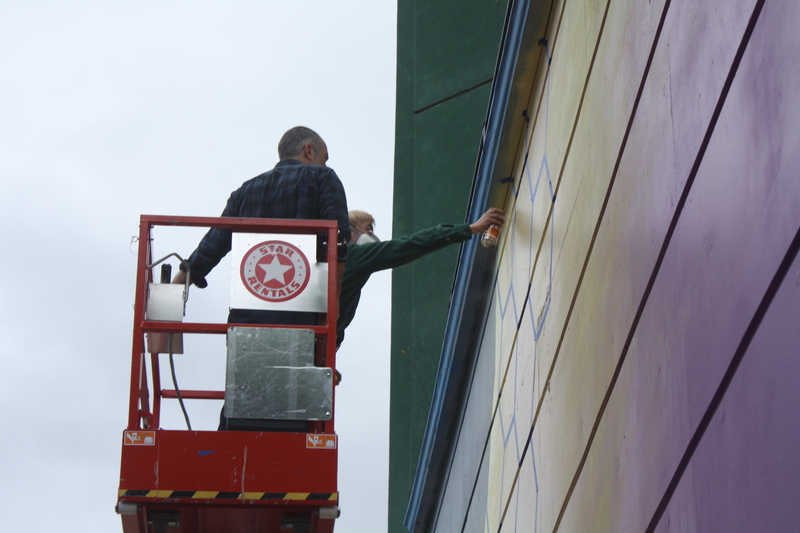 Here’s a peek at what it will look like when it’s complete — and some images from the last day of the school year Wednesday as the students in Curtis Erlinger’s “Public Art” class helped Wu put some of the finishing touches on the 140-foot mural. Wednesday afternoon, a dozen or so kids with spray masks and spray cans in hand were setting to work on the painting which depicts Hill resident Marz Martinez and a hive of buzzing bees. Because of the space’s past as home to a Barack Obama poster installation, muralist Wu said there is an inflated sense of who the person in the painting must be. Well, that, and the fact that she appears in a mural… “The wall is intended to depict the inward journey that we go through during the rainy season that makes Seattle such a blooming ground for creative talent whether visual art, music, literature, or performance,” Wu wrote about the project that was created in collaboration with the students. In addition to giving the kids the opportunity to hone techniques and have an outlet for their creative spirits, the class has also presented some of the kids more serious about street art with more to think about when it comes to issues around tagging and graffiti. Wu said seeing the popular work on the Sound Transit construction wall defaced gave students a new perspective on the lines between vandalism and street art as they set about trying to create something with permanence using only paint. 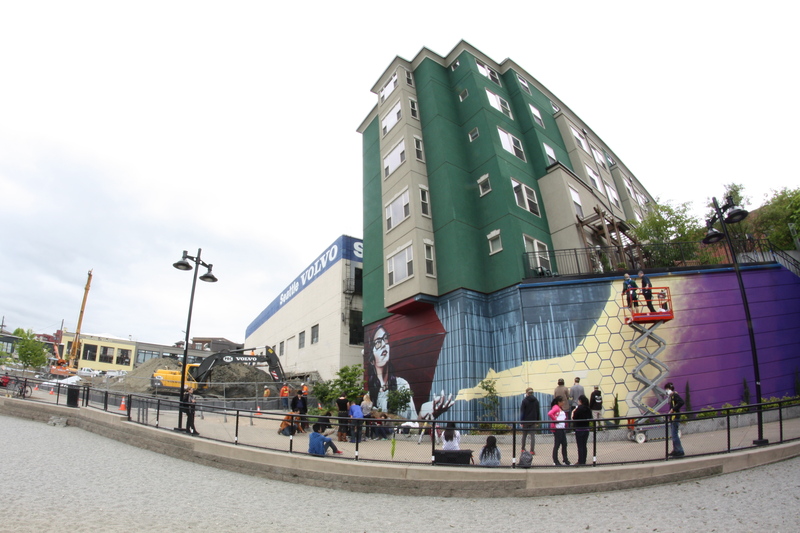 The mural is slated to be finished by June 21st. 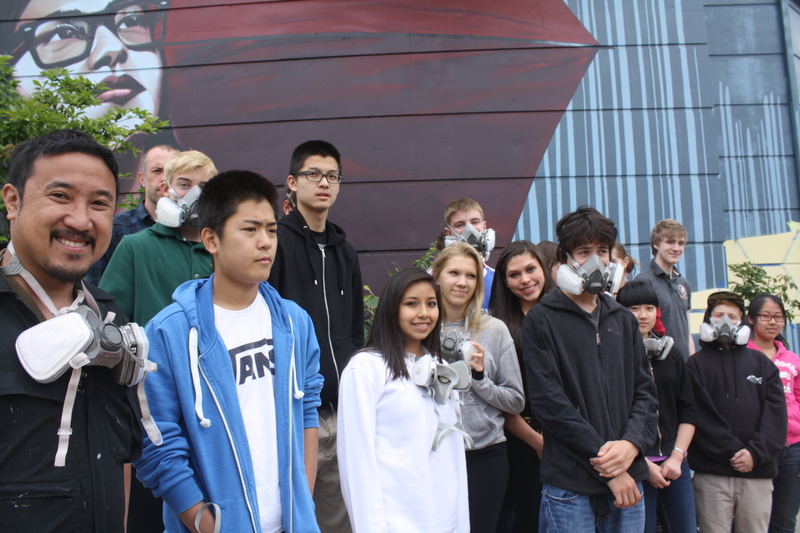 Thanks to Northwest School Public Art class, Derek Wu and all who collaborated to make this happen! I have been watching it come to life daily as I walk/bus past it. So very good. Thanks to the NW School & Derek Wu for this awesome artwork. This mural is a GIGANTIC improvement and benefit to the area. The ground below the Villa used to be filed with needles and crime and now that area is a pleasure and joy to walk by and be in. The mural is actually good art as well, something we don’t see much of outside in Seattle unfortunately. These folks should paint everywhere. Amazing art. I love walking by this mural everyday. Makes me happy to live in this neighborhood.